Older Daughter and son-in-law are the most incredibly creative parents I know. I understand where my son-in-law gets that from: His parents are do-it-yourself and use-what-you-have advocates from way back. I’m not sure where Older Daughter gets it from since my idea of creativity is making peanut-butter chip instead of chocolate-chip cookies, but somehow she takes ideas from Martha Stewart and inspiration from Pinterest and, with a few fabric scraps and leftover nails, she’ll end up with something wonderful. 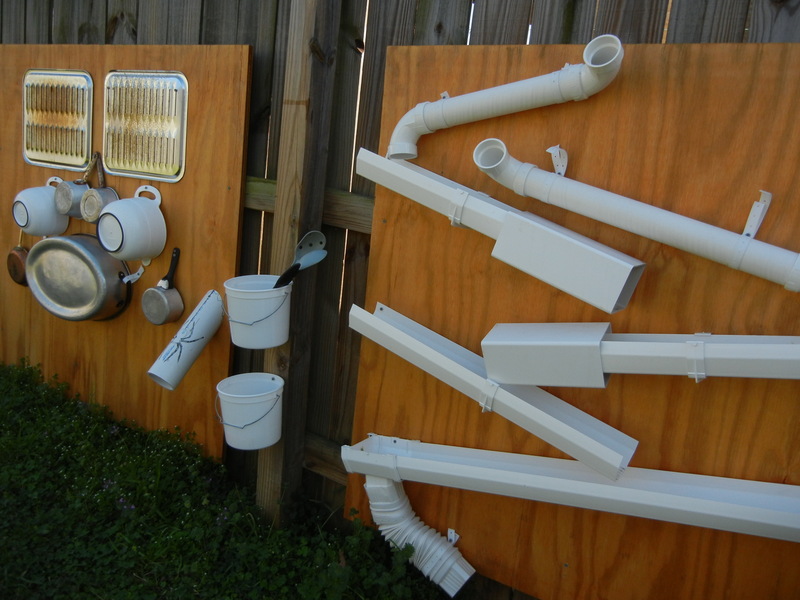 The two of them collaborated on this fantastic backyard project that’s the talk of their neighborhood: A music station and a tunnel-maze, both made from found and recycled items. First, they collected their materials. Older Daughter hit yard sales and resale stores for the used kitchen tools that would become the musical instruments, and my son-in-law measured and cut leftover PVC pipes for the maze. They then spent much design time working out the configurations before attaching everything to the two plywood pieces they’d nailed to their fence. The buckets in between hold spatulas, whisks, spoons and other “mallets” for music-making as well as cars and balls for the maze (which also, as almost-4-year-old grandson Capt. Adorable naturally needed only 30 seconds to figure out, works great for small water balloons.) Whenever I visit the Captain’s friends come over, I head they run straight for the backyard. Listen, I can play a mean roasting rack, accented with a really cool saucepan beat. This entry was posted in Alabama, art, family, fitness, friends, home and tagged backyards, Chocolate chip, Chocolate chip cookie, cooking, DIY, do it yourself, family time, home, Martha Stewart, outdoor play, Peanut butter, Pinterest by Coffee with Cathy. Bookmark the permalink. I love it. What a fun place for a kid (or a gramma) to play.